The two may be similar but they are not the same. In case you don't know yet, AHA (Alpha Hydroxy Acid) and BHA (Beta Hydroxy Acid) are exfoliating ingredients that give you a smoother, radiant complexion. Despite the word "acid" in their name, these ingredients are mild—you won't see your skin peeling off. You'll just notice that your face looks brighter each day. 1. They work for different skin types. AHA, which is water-soluble, gently remove dead skin, hold moisture in, and help increase collagen production over time. It's an excellent product to use for someone with dry and sensitive skin because of its clearing, hydrating, and anti-aging properties. BHA, on the other hand, is oil-soluble. It is great for those with oily and acne-prone skin because it can treat acne, blackheads, and whiteheads by penetrating each pore and removing the deep-seated gunk. Like AHA, it prevents premature aging and boosts collagen production. The only difference is, BHA can't provide hydration. 2. They're gentler than manual scrubs. Physical exfoliators often contain hard and gritty ingredients that cause micro-tears in the skin. These acids, however, are non-abrasive and work at a cellular level to "break apart the uppermost layer of skin." This process aids the removal of dead and damaged skin cells to reveal a healthier complexion. 3. You can immediately apply other products on top of them. AHA and BHA both have a lightweight, liquid consistency that is instantly absorbed into the skin, allowing them to get to work. 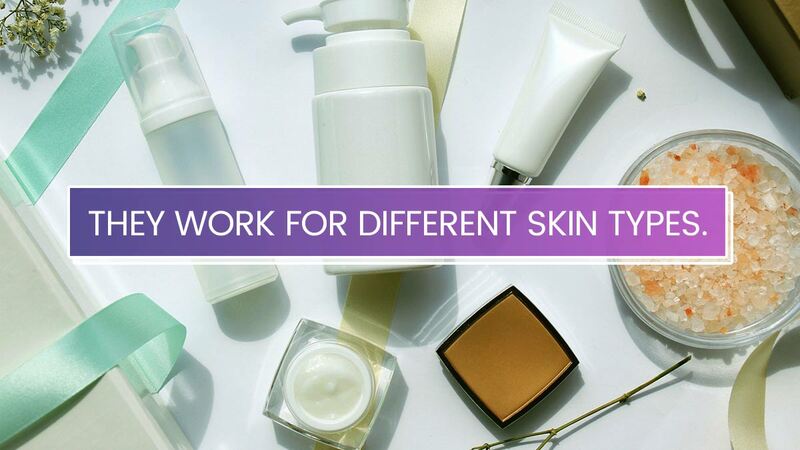 You can layer your serums, moisturizers, and sleeping masks on your face right away! 4. They have different "forms." Glycolic acid, lactic acid, and mandelic acid are the most common forms of AHAs. Glycolic Acid can penetrate deep into your skin to repair it; but be careful, because overusing it could lead to irritation. Lactic Acid is milk-derived and addresses issues such as redness. And if you have acne-prone skin, look for products with Mandelic Acid as it has anti-bacterial properties. 5. There are side effects. The most common side effects of using AHA and BHA are redness, stinging, and mild flaking of the skin, according to Live Strong. But don't fret, this only happens in the beginning, when your skin is still not used to it. Another side effect you need to be wary of is being more sensitive to the sun, so it's better that you use AHA and BHA products only at night time. But if you want to use it during the day, apply a high SPF sunscreen to protect your face from getting sunburnt easily.